Since action cameras became popular a few years ago, the internet has been flooded with POV videos of various activities. The quality of these has been varying, to say it kindly, and I have been quite uninterested to contribute to that. Correctly used, though, an action camera can add valuable material to short films and I feel I've been missing out on that. I've been on the verge of buying an action camera for the entire year. The first alternative on my list has been the GoPro Hero HD 2, which until recently was the alternative with the best video quality. Just a few weeks ago, Sony came out with their take on an action camera. The Sony camera has a lot going for it, including the price, but it was a disappointment that the optical image stabilizer does not work with the widest field of view, which at least for bike riding videos has been very popular, since it gives an impression of good speed even where there is none. The decisive factor against the Sony action camera for me was that there was no support for the PAL 25p framerate. The GoPro Hero HD 2 would seem to be the best option, especially if the promised firmware update enabling reasonable bit rates (up to 35 Mbps) ever becomes available. It is rather pricey, though, and a set with the needed mounts would cost 350-400 €. A lot of money for something that would get used for only about 20 seconds of a short film lasting a few minutes. As I see it, an action camera is a very specialized item and not good for much else, due to the strong optical distorsions and performance compared to an ordinary camera or video camera. I already have a good camera for video and a good solution for timelapse photography, so I would only need an action camera for some short POV clips when riding a bike. Still, a GoPro Hero HD 2 was on my wish list until I yesterday for some reason saw that Gigantti had a clearance sale on the Contour Roam action camera. The Contour Roam is a cheaper model and with a clearance price of 129 €, I decided to give it a try. The below video shows some of my first impressions (note that Vimeo has degraded the quality of the video). The form factor is quite good, though it won't easily fit a chest harness, which could be a big deal for some people. The GoPro chest harness is supposed to fit, though, using an adapter for the Drift action camera. I like the fact that they have made it waterproof for ordinary use (1 m and 30 minutes) without the need for an extra waterproof case. It has a single button for starting and stopping recording it and not much more. The settings have to be changed on the computer (or by using different memory cards with different settings). The rotatable lens and laser marks makes it quite easy to get it level. It can also be directly mounted on a tripod without an extra adapter and the Contour Flex Strap (40€) fits a bike pretty well. Am I satisfied with the Contour Roam? No, not really, but would a GoPro Hero HD 2 be notably better? The GoPro HD 2 gives a nominal 1920x1080 resolution with a 170° FOV compared to the 125° FOV of the Contour Roam at 1920x1080, which is an advantage to the GoPro. In practice the different might not be as big, and I think the 1280x960 resolution is better since it gives some room for adjusting the video heightwise in the video editor. 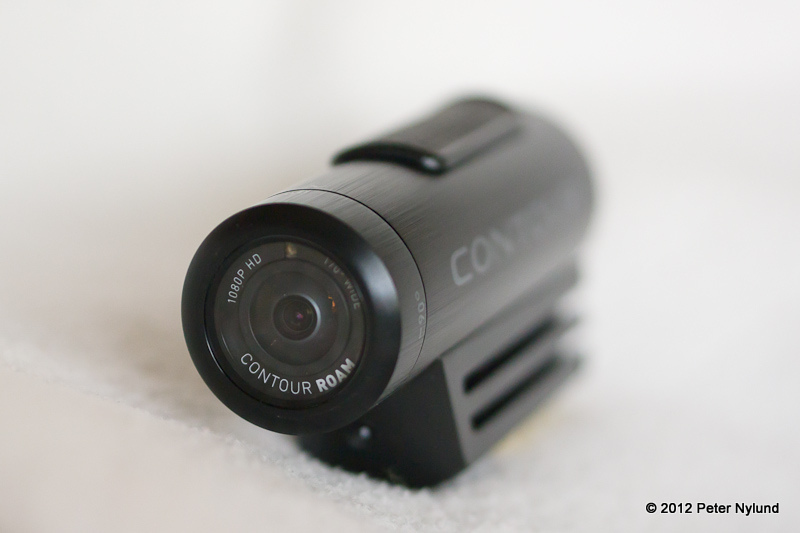 With both the Contour and the GoPro, the video quality is limited by the poor optics and the limited bitrate of max 17 Mbps. Compare this to my Panasonic GH2, which with the FlowMotion 2.02 patch gives 70 Mpbs with a better encoder. In one aspect, the Contour Roam is clearly better than the GoPro in my view: The fisheye distortion is not nearly as bad, though it is still there. I still see an action camera as only a complement to a real camera, since the video quality is so poor in comparison. For me it will be used to get some POV shots from interesting angles as well as some material from situation that an ordinary camera cannot handle, like water and rain. This post was updated after using the camera a little more.